Unexpectedly, Trend Research have updated their controversial study from 2013. 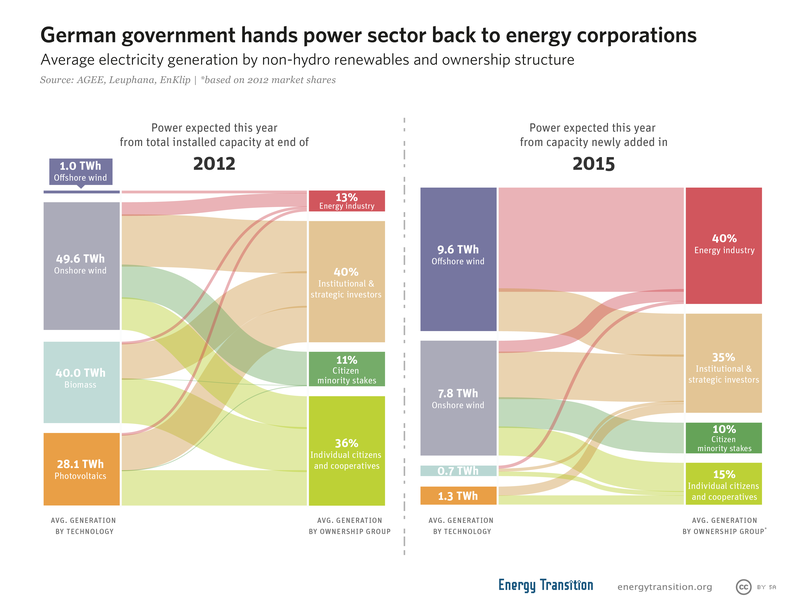 The share of citizen investments in renewables remains high but has clearly fallen. Craig Morris goes in-depth on the controversy. Let’s go ahead and start with the new data up to 2016 in Trend Research’ study published in December 2017. You can get it here for a mere 2,500 euros. One industry insider told me that no one contracted the study, and I have found no one who saw it coming; Trend Research merely had the data and were able to produce an update after four years – hence the price tag. We see here that citizens (households and farms) still made up 42.5% of investments in renewables up to 2016 (the numbers are not for 2016 alone). Utilities, which made up around 90% of investments in energy generation infrastructure just two or three decades ago, now make up less than a sixth (15.7%). 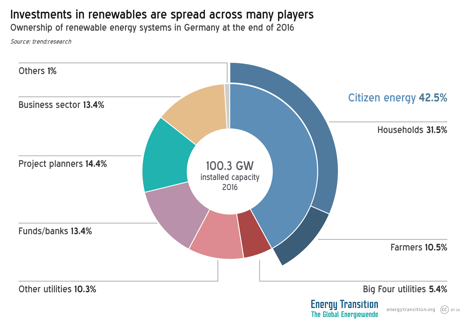 And the “Big Four” German utilities who used to cover 75% of the market only account for 5.4% of investments in renewables. 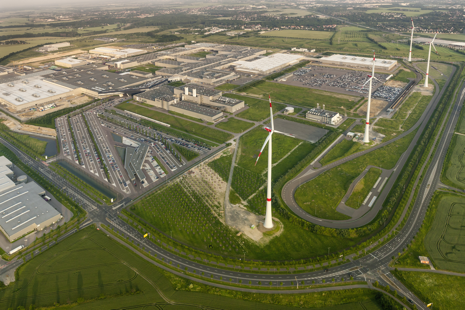 Indeed, the very term “Big Four” is increasingly outdated not only because of this small share of investments, but also because the two biggest ones, RWE and Eon, have each split into two separate companies: one with renewables and the grid, and the other with conventional fossil and nuclear assets. The “business sector” is another newcomer one might consider adding to an extended definition of “citizen energy.” These companies can be everything from family-owned local shops to grocery store chains that have added solar roofs (such as Aldi, also known as Trader Joe’s in the US) – or BMW’s four utility scale wind turbines on the side of the production plant that manufactures one of its electric vehicles. But if businesses outside the energy sector might also be considered citizen energy, what about project developers? In recent auctions, they won 90% of the capacity tendered under the new definition of “citizen projects.” But here’s where the problem starts: no one was happy with that outcome. Other developers felt disadvantaged by the new rules, and true citizen projects complained that project developers had merely put together a group of strawmen as a front organization for eligibility under the rules for citizen projects – they weren’t considered genuine. And that’s just the beginning: international comparisons are practically impossible – at least, I haven’t seen any attempts at similar charts outside Germany. But in all likelihood, more than 40% citizen ownership (however defined) is probably one of the highest levels anywhere. We see that the share of citizen energy has fallen from 47% at the end of 2012 to 42.5% at the end of 2016 (again, cumulatively, not for those years alone). In 2016, we attempted – based on quite limited data – to show the pushback against citizen energy. In the chart below, we compare the Trend Research data for all years up to the end of 2012 with 2015. Citizen energy had fallen to 25% that year. Unfortunately, no one at Trend Research responded to my query for this report. 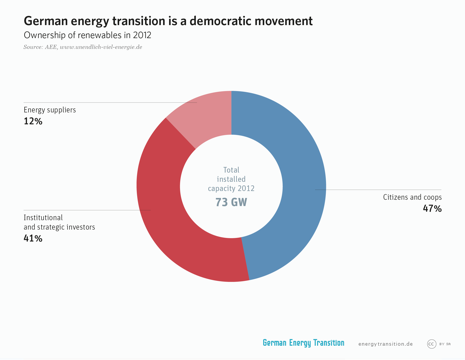 But once this data gets circulated, the impact will probably be the same: foreign onlookers will be amazed at how much renewables belong to citizens in Germany even as that share rapidly decreases. The attempt to protect citizen wind projects had the unintended outcome of project planners setting up groups of strawmen, so the preferable treatment of such projects in auctions is to be done away with. At the beginning of February, the German Bundesrat (the upper chamber of parliament) officially advised the Bundestag (the lower chamber) to lift this preferable treatment for the next year and a half (report in German). In terms of power generation, the only remaining legal support for citizen energy projects is the new law allowing households to sell electricity to each other – a topic so complicated it would need its own blog post (or you can start with CLEW’s overview here). Public ownership means citizen/private ownership as well, for example the Stadtwerke are held by communities … and not for the quick profit. Previous PostHigh German power prices, low monthly bills?